13 is a scary number for some and alas, it might just be for President Donald Trump, too. On Sunday, he visited one of his golf clubs, making this the 13th since his inauguration. Although one would think that the President wasn’t superstitious, he can’t escape the ‘curse’ of this event. Once upon a time, when Barack Obama was the President, Trump used to object his passion for golf. He would criticize Obama for ‘playing, instead of working’. Well, this was one of the many things Trump himself used to win people over. 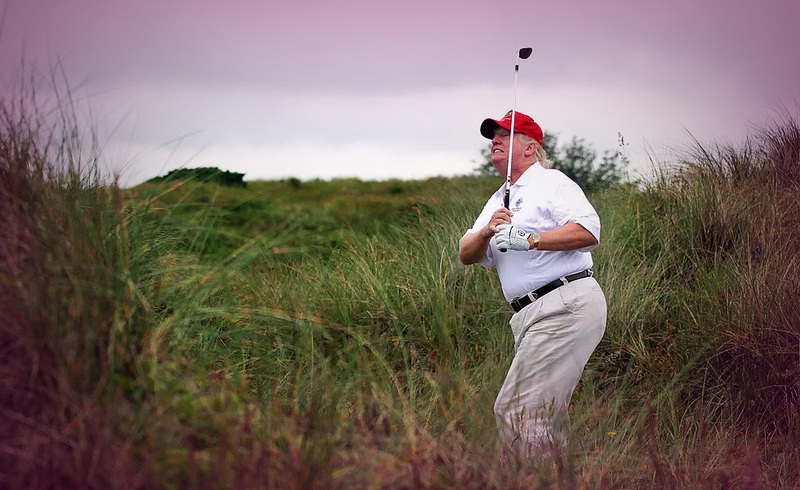 He said that he would not spend his time golfing, because he would be working so hard. Well, one has to give him that, he is working hard. He has done many things during his first months as president. Surely, he deserves a break or two? They happen to be on one of the several golf courses he owns, so what? He does host events and meetings there, too. What could possibly be a more relaxed environment for discussing politics? Except, not everyone would agree. There is a rumour going around, that the President needed some time to digest the news. His health care plan fell flat on its face (sadly? ), so one can imagine Trump’s need to escape it all. At least for a little while. There are even others who say that this habit of Trump’s is against what his oath was about. The ‘truth’ is that this time as well he had meetings at the golf club. Okay, he might have been playing golf ‘on the side’, but he did go there for the meetings. Still, the fact that he criticised Obama for the very same thing made people raise an eyebrow. They aren’t saying there is anything bad in him pursuing the popular sport, no. If he says one thing and then does another, that’s a whole different thing. Let’s ask the cards to see whether his golfing habit will give him more trouble in the future. Then again, he is one of the most controversial presidents of all time. Just about anything he does (or doesn’t do) can trigger opposition. Everyone needs a way to express their true self through creativity. For Trump, that means golf (among other things). This is a time of giving, and why not tie it to his favourite pass-time activity? It’s way more fun than holding meetings in the boardroom. Many powerful bonds are formed on the field and, in this case, on the golf course. So, these events are especially satisfying on every level. Both for Trump and his business partners. Ambition, determination and a desire to succeed. Characteristics that describe this card, and represent Trump. Mocking Obama’s love of golf was only a means to an end. Just like that time, there is no stopping him now.